Let’s assume that you and three of your competitors visited a prospect yesterday, in separate appointments. All of you know that quick follow up is vital. So competitor number one takes the most traditional approach, writing a thank you letter. Competitor number two e-mails the prospect, using text only. Competitor number three gets a bit more personal with a thank-you phone call. Instead of these standard approaches, you e-mail a short (2 minutes max) personalized video, thanking the leader for her time, summarizing key points, and promising agreed-upon action. Guess whose follow up message will be commented about, shared with colleagues, and answered quickly. Yours, of course. Why? Because we’re a highly visual age. —Post short how-to videos on You Tube. Will people notice them? Yes, if you meet a felt need. When I posted my first Stage Fright video, I expected the topic would attract some viewers. This morning I noted that 77,900 have watched it. Amazon has published 114 of my book reviews. After I learned video production, I changed from text reviews to video reviews. My video reviews jump out prominently from those that are only text. –Post a video welcome to every page on your Web site. You want visitors to feel your presence vividly. Video accomplishes that far more compellingly than text or audio, which once were the only options we had. 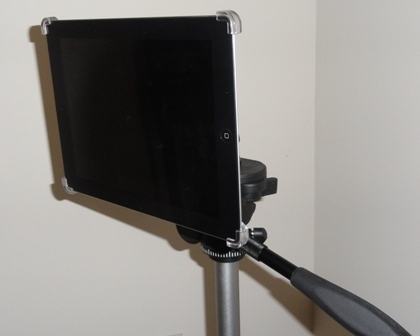 Yesterday I met someone who asked, “How do you mount your iPad onto a tripod?” Quickly, I produced a short video that included three helpful photos. You see one of those photos above. Wayne and Don Adams wanted to learn iPad video production so they could showcase the promotional products of their company, Premier Branded Specialties. After bringing me in for a half-day of instruction, they started posting quality videos within a day or two–and they will keep doing that. Yes, once we had to rely on full-time professionals when we wanted video production with high quality. Now all of us have access to a cost-effective system that will allow you to learn video production yourself, more easily than you could predict. I strongly encourage you to learn iPad video production. I will work with you on site individually, or train your team there. Before we get together, I’ll tell you the basic apps and equipment you’ll want to acquire. So. . .get started today, using my contact information below. If you don’t have an iPad. . .buy one! Best professional investment you will make in many years. Example: My previous video production system forced me to follow an 18-item checklist. With iPad, once I practiced I needed no written reminders. Discover how, after my Video Training, you can produce top-quality videos with your iPad camera–easier and cost effectively.